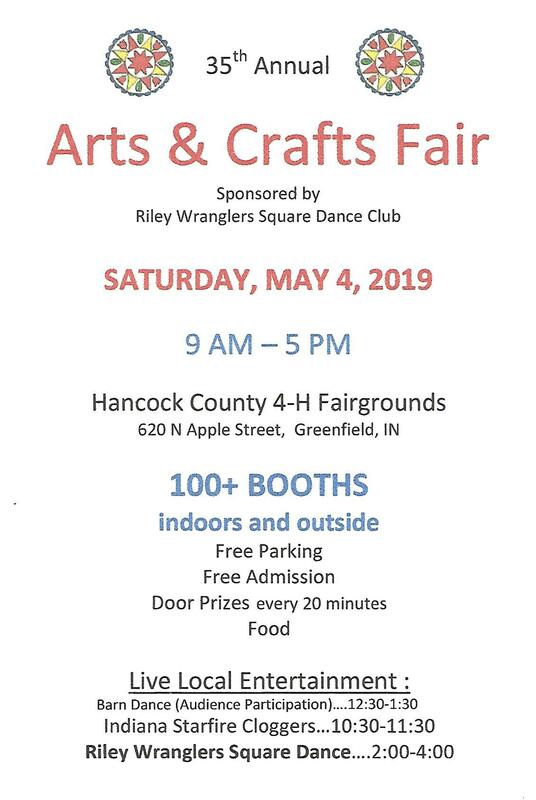 The Riley Wrangler Square Dance Club from Cumberland, Indiana, will be sponsoring its 35th Annual Arts & Crafts Fair on Saturday, May 4, 2019. The event will be held at the Hancock County 4-H Fairgrounds (620 N. Apple St.) in Greenfield from 9:00 AM – 5:00 PM. There is free parking and free admission. The buildings are all handicap accessible. Door prizes will be given away approximately every half-hour. There will be over 100 vendors (in three buildings and outside) selling art, craft items, food, and home improvement items. This is a perfect opportunity to purchase gifts for Mother’s Day (May), Father’s Day (June), Memorial Day, July 4th and other special summer events. Vendors from around the state will be selling items such as hand-made jewelry, quilts, stained-glass, wood crafts. home decor, oil paintings, floral arrangements, leather crafts, antiques, dog accessories, baby clothes, and more. There’s something for everyone. Food vendors will be selling sandwiches and other food items to please your taste buds. There will be live entertainment throughout the day. The Indiana Starfire Cloggers will be performing from 10:30 AM – 11:30 AM, Marcus Young from 11:30 AM – 12:30 PM, as well as a free square dance from 2:00 – 4:00 PM. For more information, call 765-763-6289 or 317-459-1319.